Sony has long been a mainstay in the multimedia laptop market, but its designs have recently begun to show their age. The VAIO VGN-FW11ZU (£1299 inc. VAT) brings it fully into the high-deﬁnition (HD) era, with a stunning new style, the latest technology and great usability. The silver chassis uses curved features, a cylindrical hinge and green lighting to eye-catching effect. It weighs 3kg, so basic mobility is provided. This is backed-up by a poor 156-minute battery life, however, so is best used around the home rather than on the move. The keyboard has each key protruding through its own hole in the chassis. This reduces the chance of accidentally striking adjacent keys when typing. Usability is generally excellent, although the keys have a short typing action. Performance failed to impress, despite the use of Intel's latest Centrino 2 technology. There's ample power for home use, including basic movie and photo editing, but our tests showed results akin to an entry-level system, rather than a high-end media centre. Due to driver-compatibility issues, we were unable to benchmark graphics performance. The ATi chip is ideally suited to HD use, however, and processes HD video directly, for the smoothest possible playback and editing. The 16.4-inch screen has a 16:9 aspect ratio – rather than the 16:10 design of most laptops – to show widescreen movies in their native resolution. It also features dual-lamp technology to double the brightness of rival laptops. Colour, contrast and image quality are all stunning. The built-in optical drive is fully Blu-ray compatible for playback and creation of HD content. You can not only watch the latest HD releases, but also play back and record to all standard DVD and CD formats, as well as write data to high-capacity recordable Blu-ray discs. The 300GB hard drive provides plenty of space for storing and editing high-deﬁnition videos, as well as all your music and photos. Files can also be easily transferred to and from your digital camera or smartphone, using the card reader at the front of the chassis. The integrated camera above the screen allows instant messaging use and directly captures photos and videos. A multimedia control panel above the keyboard also provides instant access and control of your music, photos and movies. 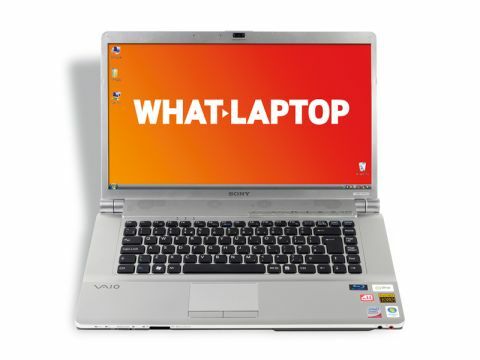 The Sony VAIO VGN-FW11ZU has a great combination of features and usability for the price. Its performance may not suit more demanding needs, but as an affordable HD media centre, Sony has set a new benchmark for its rivals.